I’m back! After more than a month being at my parent’s house in Massachusetts I have finally returned to my tiny Brooklyn apartment. It has been nice being spoiled by my mom who is a great cook, so I must admit I felt some trepidation returning to my little galley kitchenette. The first night I was able to convince my husband to order Thai from Lemongrass Grill (love their shrimp pad thai, spicy #2). The next night we met our close friend Isaac for pizza at Sottocasa (I had the Boscaiola which has italian sausage, gorgonzola, mushrooms and basil-really good). So after two nights of avoiding my kitchen I finally had to face reality, and my budget. Night 1 I made my salmon al cartoccio since our friend Scott was coming over and it’s easy to make for company AND socialize. I hate being stuck in the kitchen cooking when we have guests over. It’s 2013, folks. Salmon, of course, can be a little pricey, so I wanted to make something a little cheaper last night. We had some apples in the fridge from June that I didn’t want to throw away but didn’t necessarily trust 100%. I found this recipe in my Fannie Farmer cookbook. It’s designed for outdoor grilling, but since we are apartment dwellers that’s not an option. I used 2 skillets instead. This whole meal cost me less than 11 dollars since I only had to buy the pork chops (less than $5 and an apple corer – which I didn’t own but wanted to buy). I suppose I could have cored the apples very carefully with a knife but I figured I could use this apple corer in the future too. Without peeling the apples, core them and cut them into 1/2 inch rings (make sure you use a large sharp knife for easy cutting). Stir together the butter, cinnamon and sugar and set aside. Heat up the grill (or skillet). Sprinkle your chops with salt and pepper and grill them until no longer pink inside. 10 minutes per side should definitely do it. 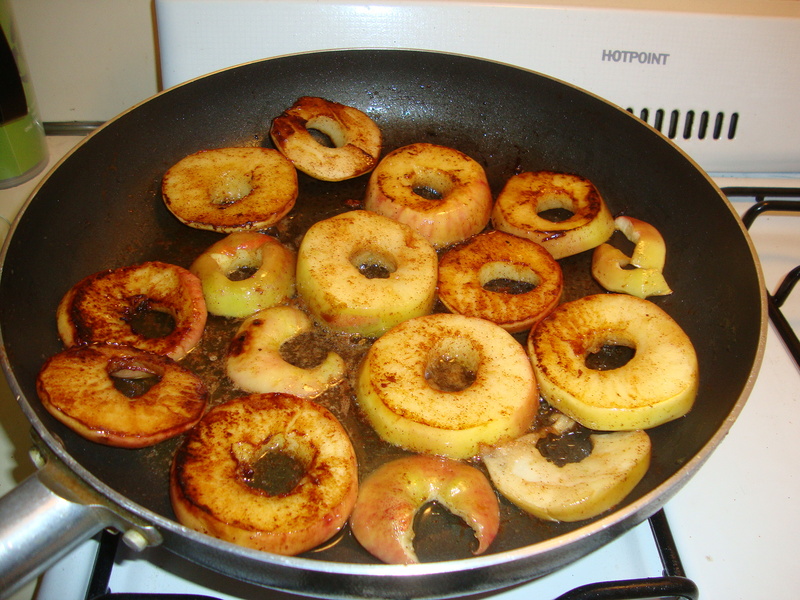 In my other skillet I began cooking my apple rings. I turned them occasionally and brushed them several times with the butter-sugar-cinnamon mixture. The sweet apple mixed with the saltier pork is a great combination. I have some leftover apple rings, which I think will go great as a little dessert tonight, perhaps with vanilla ice cream.